A popular weekly situation comedy called "Get Smart" ran on the American Broadcasting Corporation television network in the United States for five seasons in the 1960s. In the show—a spoof of spies and espionage organizations—the lead character, Maxwell Smart, often communicated with his colleagues via a "shoe phone." The television series and the espionage equipment were conceived as a nonsensical spoof of the spy movies that were in vogue at that time. Nonetheless, the shoe phone was grounded in reality. During the Cold War, with tensions arising between the United States and the former Soviet Union in the 1950s and 1960s, both nations conducted espionage campaigns to collect information from the other country that was deemed vital to national security. 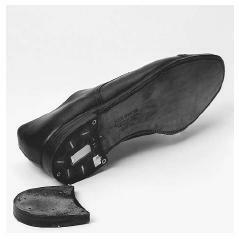 As part of these efforts, the Soviet spy agency known as the KGB (Komitet Gosudarstvennoi Bezopasnosti, which translates as the Committee for State Security) devised a microphone and transmitter that could be concealed in a shoe. The shoe transmitter could detect conversation in the immediate vicinity and broadcast the conversation to a receiver located in a nearby secret monitoring station. Essentially, the shoe transmitter was a tiny radio station, broadcasting on a frequency that would be detected only by the special receiver. The shoe transmitter was intended to eavesdrop on conversations of someone who could supply important and privileged information. A pair of dress shoes designed to be worn for business purposes—one of which contained the microphone and transmitter in a hollow heel—was planted in the home, hotel room, or office of the subject. This was done by someone affiliated with the KGB who had ready access to the subject such as a maid, valet, or co-worker. When the shoes were planted, a pin located in a hollowed-out heel was pulled out. This activated the radio beacon and the microphone, allowing conversation to be recorded until the batteries that powered the equipment ran out of power. With the coming of more sophisticated bugging technologies in the 1970s, the use of the shoe transmitter was phased out. However, at the time the, device was a sophisticated piece of equipment and demonstrated that miniaturization of electronic hardware was possible. Unlike its comedic counterpart, the device could not be used to make telephone calls. A copy of the shoe transmitter is now on display at the International Spy Museum. The museum opened in July 2002 in Washington, D.C.
International Spy Museum. "Collections Overview." < http://www.spymuseum.org/media/collections.html >(20 December 2002).